Denis Allex, from one of two Shabaab propaganda tapes. On Thursday, Jan. 17, Shabaab announced that Allex was indeed executed. “16:30 GMT, Wednesday, 16 January, 2013. Dennis Allex is executed,” Shabaab said on its official Twitter account. The al Qaeda affiliate announced the decision to execute Allex in an official statement that was released on its Twitter site, @HSMPress (Harakat Al-Shabaab Al Mujahideen Press Office). In the statement, Shabaab pinned the blame for Allex’s death sentence on France, and denied the French claim that the hostage was killed during the rescue attempt. Shabaab has maintained this position since the first report of the raid, while French officials claimed that Allex was indeed killed during the rescue attempt [for more information on the French raid, see LWJ reports, Shabaab releases photos of French commando captured in failed rescue mission, and Shabaab kills, captures French soldiers during failed rescue mission in Somalia]. “With the rescue attempt, France has voluntarily signed Allex’s death warrant. Following the failed operation, [French Defense Minister Jean-Yves Le Drian], aware that execution is the natural corollary of treachery, announced that the punishment had already been meted out, despite the fact that Allex was at the time alive and safe in another safe house,” the group said. Shabaab said it would kill Allex after years of attempting to negotiate with France, and finally decided to kill him after the French commandos killed civilians during the rescue attempt. Two French commandos were killed; one of them was captured and subsequently died of his wounds, according to Shabaab. Two days ago, Shabaab released photographs of the captured French commando, who they claimed was the mission commander, and displayed his body with his weapons and gear. “The death of the two French soldiers pales into insignificance besides the dozens of Muslim civilians senselessly killed by the French forces during the operation,” Shabaab stated. Shabaab also claimed Allex was sentenced to death for France’s involvement in military operations in Afghanistan, Mali, and other “Muslim lands.” French troops have entered Mali to help the government retake the north from an Islamist alliance made up of al Qaeda in the Islamic Maghreb, Ansar Dine, and the Movement for Oneness and Jihad in West Africa. Last week, the jihadist groups advanced southward to take control of Bamako, the capital. The three militant Islamist groups have controlled northern Mali since the spring of 2012. “Avenging the deaths of these civilians and taking into consideration France’s increasing persecution of Muslims around the world, its oppressive anti-Islam policies at home, French military operations in the war against Islamic Shari’ah in Afghanistan and, most recently, in Mali, and its continued economic, political and military assistance towards the African invaders in Muslim lands, Harakat Al-Shabaab Al Mujahideen has reached a unanimous decision to execute the French intelligence officer, Dennis Allex,” the terror group said. “But before the French forces could reach their destination, the Mujahideen in Bulo-Marer were alerted by HSM intelligence teams who had information of the French movements,” Shabaab stated. The description of events roughly matches a report that was published by Shabelle. 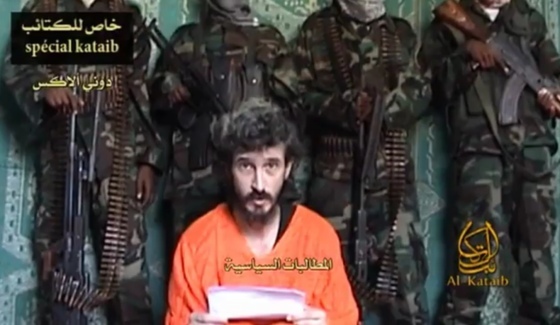 Allex and Marc Aubriere, two French intelligence agents, were captured in July 2009 at a hotel in Mogadishu. Both men were posing as journalists and trainers for the Somali military. Aubriere escaped under mysterious circumstances and it is rumored the French government paid a ransom for his release. France launched the rescue mission to free Allex as it was feared he would be executed by Shabaab in retaliation for the French intervention in Mali. Shabaab officially merged with al Qaeda in February 2012 after working closely with the global terror group for years.